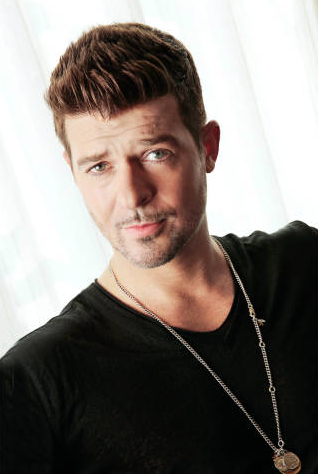 Robin Thicke says he and Paula Patton are in a good place, promises next album will tell all. After Robin Thicke and Paula Patton announced their separation in February, the "Blurred Lines" singer opened up about his bid to get her back with an emotional tribute at one of his concerts. In one of his first interviews since their split, Thicke, 37, explained why he decided to voice such raw emotions during his tour. "My music is very honest about what I'm going through and my songs are about my life," he told PEOPLE at the grand opening party of Express Times Square in New York City, where he performed on Tuesday. "And my relationship with her was 21 years of my life, so I just thought it was important to me to let people know how much she means to me." And while Patton, 38, has yet to publicly acknowledge his messages, Thicke says she was touched by them. "She loved it," Thicke added. "She thought it was the sweetest thing and very romantic, and I've always been a romantic guy that way." Though Thicke was mum on the topic of a reconciliation, he insists that the couple – who are proud parents to son Julian, 3 – are in a great place. "We're both doing well. We're both very happy right now – much happier," he said. "Everything about this moment in my life – this amazing year I just had and what I'm going through personally – has actually ignited some of the best writing I've done in a long time." "Whatever everybody's wondering about, they're going to hear it all in the album," he added. As for his goals for the rest of the year? "Just to be a great father and hopefully write some great music, put on some great shows and be a great friend to Paula," he said. Sit down you skeevy, druggie man whore. your 15 minutes is up. once you stole from Marvin Gay and did not give credit your welcome mat was snatched. nobody cares about you and your thick neck line backer shoulders, shaped like sponge bob square pants wife.